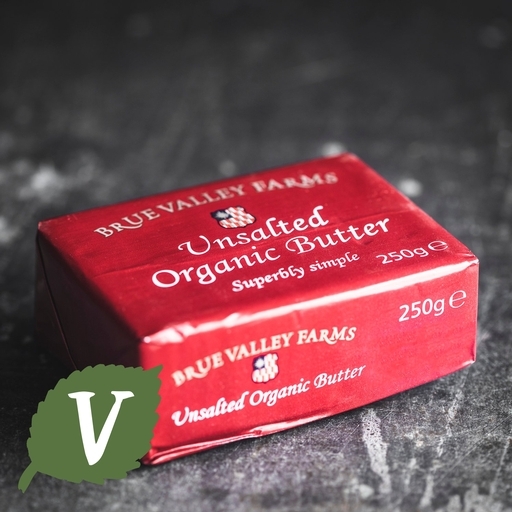 Organic unsalted butter from Brue Valley Farms in Somerset. This grass-fed butter is naturally sweet tasting, made with nothing but fresh milk cream from the Clapp family’s well-loved Holstein herd. It’s double-churned for an extra-creamy texture. Keep in the fridge for up to 6 days or freeze on the day of delivery - butter without salt will go off quickly at room temperature. Churned English butter (milk), minimum butter fat (80%).